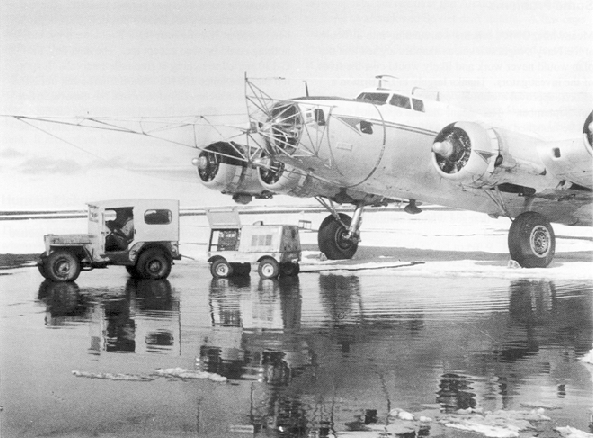 In “Operation Coldfeet,” two parachutists were retrieved from the Arctic Ocean sea ice after visiting an abandoned Soviet Camp using a then-novel "skyhook" technique. As declining sea ice and warmer temperatures speed the opening of the Arctic Ocean, the story of “Operation Coldfeet” is a reminder of just how much things have changed over the decades. This tale from the height of the Cold War is a lesson about the challenges of gaining access to one of the most remote regions on the planet. On a secret 1962 mission, the U.S. government dropped two parachutists onto an ice island deep in the Arctic — but it had no way to land a plane to pick them up. Enter the Fulton Skyhook, a contraption that allowed humans to be retrieved by a passing airplane and reeled in like a prized catch while being towed at 240 km/h, or 150 mph. The skyhook, officially known as the “surface to air recovery system,” was used for decades by U.S. military and intelligence agencies. Many people around the world first became aware of this device when the 1965 James Bond movie “Thunderball” featured a scene in which Bond and a female companion were plucked out of the ocean via the Skyhook. The stunt in the movie, available on YouTube, is as good a demonstration as any of how the equipment worked in real life, saving one person at a time. In fact, the movie producers used the same CIA-owned B-17 that had rescued the two parachutists three years earlier from the Arctic Ocean in “Operation Coldfeet,” the first military mission to use the equipment. Inventor Robert Fulton, who also developed a flying car known as the Airphibian, drew inspiration for the Skyhook from the railroad technology used to pick up mail bags along the tracks by catching them on a hook. Fulton’s device called for the person on the ground to inflate a helium balloon that lifted a 500-foot cable skyward. The rescue subject wore a harness connected to the cable. The nose of the airplane had a boom so that when the plane flew low and hit the line, it would catch the cable and clip to it, allowing the passenger to be winched aboard at high speed. Operation Coldfeet had its origins when the Soviet Union abandoned a military camp on a disintegrating ice island. The U.S. Office of Naval Research wanted to know what the camp could reveal about Soviet research in the Arctic. The island was hundreds of kilometers off the northern coast of Canada by May 1962. An ice runway used by the Soviets had been split by a large pressure ridge and the B-17 could not land even if that had been part of the plan, which it wasn’t. After Maj. James Smith and Lt. Leonard LeSchack parachuted safely to the camp and began to look around, the B-17 returned to Barrow (now Utqiagvik). They were supposed to be picked up 72 hours later, but bad weather delayed the plane’s return, though they had enough rations for a long stay, if that proved necessary. The Soviets had left behind several plywood huts that contained everything from coal stoves and generators to a dozen 16-mm movies and scientific notebooks and equipment. “Food was still on the stove, frozen in greasy skillets,” LeSchack said later. There was a poster in the mess hall listing the date of departure and a request that anyone finding it call the Arctic and Antarctic Institute in Leningrad. When their return flight did arrive a couple of days late because of weather delays, the men were hoisted off the ground without incident, but with some anxious moments because of winds and low visibility. The two men had collected 83 documents and 21 pieces of equipment, filling a duffel bag, which was the first load picked up by the Skyhook. Then it was LeSchack’s turn. While being towed at nearly 240 km/h with his face into the wind, he could hardly breathe. He used his arms as wings and rolled so that he could get his back to the wind. It took six and a half minutes to get him into the B-17, by which time he was disoriented and breathless, he and historian William Leary wrote in a history of the project. When it came time to pick up Smith, he started singing as he flew through the air beneath the plane. Before both men fell asleep on the flight back to Alaska, they were toasted and had a drink from a bottle of Scotch. A CIA history of the episode said the operation was a success on its own terms, as it revealed details of Soviet research in oceanography, meteorology and acoustics. But the success of the Skyhook retrieval system was the mission’s greatest achievement. “While the Skyhook system provided an important asset for all manner of intelligence operations, its utility as a long-range pickup system was somewhat undermined during the 1960s by the development of an aerial refueling capability for helicopters,” the CIA history says. Dermot Cole can be reached at [email protected].